Arthur J. "Art" Fesemyer, 92, of Ravenna died Tuesday, August 28, 2018, at his home. He was born December 28, 1925, in Donora, PA to Arthur H. and Jessie C. (Gates) Fesemyer. Art has lived in Ravenna since 1946, received a B.S. and M.S. from Kent State University, an M.S. from University of Pittsburgh, and a football scholarship from North Carolina State. He was a US Army veteran of WWII serving in the 3rd Army Chemical Mortar Battalion, marched across France with General Patton and met the Russians at Rhine River. Art was a member of the Ravenna Kiwanis, 60-year member of the Ravenna Elks, a life member of the VFW, American Legion, and past president and life member of the Portage County Retired Teachers Association. 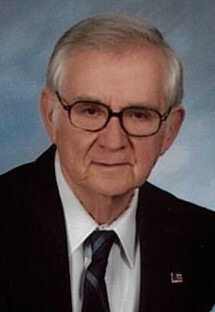 He was a teacher and administrator for area schools including Aurora and Ravenna City Schools, where he is a member of the Ravenna Schools Hall of Fame. Survivors include his children Elizabeth Wymer, Susan (Francis) Ricciardi, Becky (David) Kirby, Carol (Bill) Rudlosky, Amy (Jim) Neely, David (Cindy) Fesemyer and Tom (Mary) Fesemyer, 22 grandchildren and 32 great grandchildren. He was preceded in death by his parents, wife Jane S. in 2006 and six older sisters. Calling hours will be from 4 to 7 PM on Thursday, August 30, 2018 at Shorts Spicer Crislip Funeral Home Ravenna Chapel. A mass of Christian burial will be held at 10 AM Friday, August 31, 2018 at Immaculate Conception Church with Father William Kraynak officiating. Burial will follow in Grandview Memorial Park in Ravenna. In lieu of flowers memorials should be made to the Bereavement Fund at Immaculate Conception Church. The family would like to thank Crossroads Hospice and Home Instead for their care and support.